Shot earlier today diving the Lembeh Strait in Indonesia. Great shots Amigo. Indonesia eh? Looking forward to more. More to come now I'm home with a reliable connection. Beautiful shots!the colours & technique. This is an incredible creature you have introduced us to. I never knew they exisited, and now not only do I know they exist, but you have provided some nice shots of them. The mimic octopus, Thaumoctopus mimicus, is a species of octopus that has a strong ability to mimic other creatures. It grows up to 60 cm (2 feet) in length. Its normal colouring consists of brown and white stripes or spots. Living in the tropical seas of South East Asia, it was not discovered officially until 1998, off the coast of Sulawesi. The octopus mimics the physical likeness and movements of more than fifteen different species, including sea snakes, lionfish, flatfish, brittle stars, giant crabs, sea shells, stingrays, flounders, jellyfish, sea anemones, and mantis shrimp. It accomplishes this by contorting its body and arms, and changing colour. Many octopus species are extremely flexible. For example, one octopus the size of a volleyball can actually squeeze its entire body into a soft drink can. 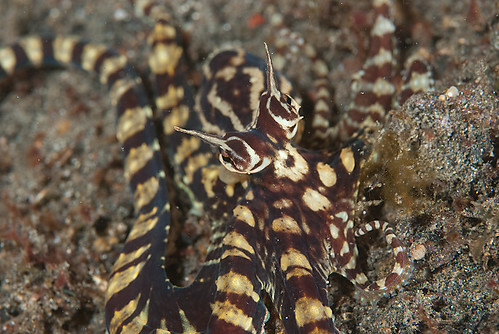 If the mimic octopus has that flexibility, it would explain in part how it mimics other creatures. 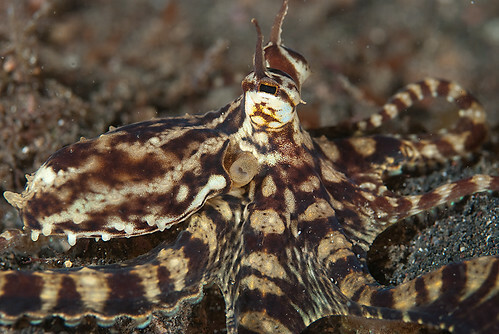 Although all octopuses can change colour and texture, and many can blend with the sea floor, appearing as rocks, the mimic octopus is the first octopus species ever observed to impersonate other animals. 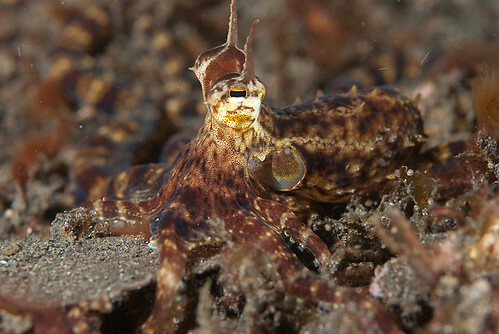 Based on observation, the mimic octopus may decide which animal to impersonate depending on local predators. For example, when the octopus was being attacked by damselfish, it was observed that the octopus appeared as a banded sea snake, a damselfish predator. The octopus impersonates the snake by turning black and yellow, burying six of its arms, and waving its other two arms in opposite directions.